At this season in 2015, when the flu is widespread given the ineffectiveness of this year’s vaccine, one need only look back at the incidence of illness during the eighteenth century to realize how much better our situation is. Martha “Patsy” Jefferson, daughter of Thomas Jefferson and Martha Wayles, was tall and slender with red hair and freckles. She had accompanied her father to Paris, when he was named American minister to France, and attended a nearby convent school. In 1790 she married Thomas M. Randolph, Jr. who later became governor of Virginia. Her father gave the newlyweds eight slaves as a gift. Patsy was devoted to her father and kept him informed of the goings-on at Monticello and her own plantation, Belmont. In 1798, she described in a letter to him the widespread illness that prevailed there. January 22nd, 1798It was with infinite pleasure that we learned you had got the better of your cold and were at least comfortably if not agreeably fixed for the winter. It is much more than we can boast of, for the extreme dampness of the situation and an absolute want of offices of every kind to shelter the servants whilst in the performance of their duties, have occasioned more sickness than I ever saw in a family in my life. Pleurisies, rhumatism and every disorder proceeding from cold have been so frequent that we have scarcely had [anyone] at any one time well enough to attend the sick. Martha Jefferson Randolph served as her father’s hostess when he was president. Her son, James Madison Randolph, was the first child born in the White House. The excerpt above can be found on page 164 of In the Words of Women. 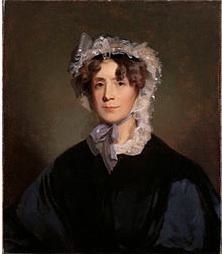 The portrait is by Thomas Sully, done in 1836 when Martha was sixty-four years old. It appears on this website.